On a visit to Belfast, Northern Ireland, the British Chancellor of the Exchequer announced that the U.K. government is to provide Bombardier with £12 million (US$15.7 million) in funding for the development of a thrust reverser for the new Airbus A320 NEO nacelle. Visiting Bombardier’s production line in Belfast, the Chancellor commented: "We are backing Bombardier with £12m of new money to help develop cutting edge technology - here in Northern Ireland - for modern aircraft," adding: "This will help to secure jobs for Northern Ireland's economy and cement the U.K.'s role as a leading manufacturer of hi-tech aircraft components." 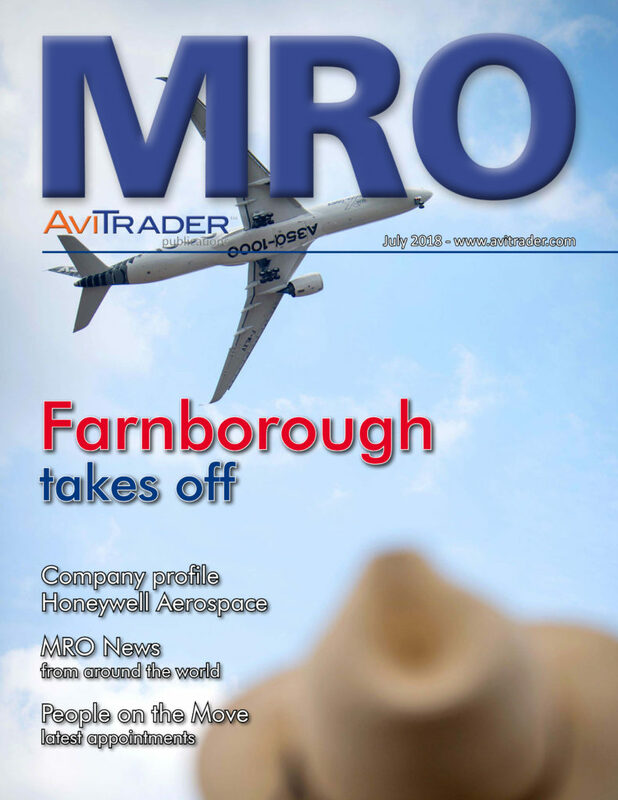 He also welcomed the new orders for 60 A220s which was announced at the Farnborough International Airshow last week. The Bombardier plant in Belfast is responsible for the manufacture of the wings for the A220, which was originally the Bombardier CSeries jet prior to Airbus’ investment in the program. The news of the government funding is the second boost the Belfast plant has received this year. Until recently it was threatened with closure after Boeing launched a complaint against Bombardier over what was suspected to be a ‘dumping’ exercise when Delta Airlines acquired CSeries jets from the Canadian plane manufacturer at below cost price. The US Department of Commerce recommended a near 300% punitive duty on sales of the jets for five years, putting around 1,000 jobs in Belfast at risk, but the International Trade Commission (ITC) in the U.S. ruled against Boeing and in favor of Bombardier in January. Boeing through its subsidiary Aviall, has signed an exclusive agreement with Sabena technics to distribute its Vigiplane security monitoring system for aircraft on ground. Under this agreement, Aviall will provide exclusive supply chain distribution support for Vigiplane in North America. Alaska Air Group has reported second quarter 2018 GAAP net income of US$193 million compared to US$293 million in the second quarter of 2017. Excluding the impact of merger-related costs and mark-to-market fuel hedge adjustments, the company reported adjusted net income of US$206 million compared to US$309 million in 2017. Alaska Air Group generated approximately US$725 million of operating cash flow, including merger-related costs and other special items. The Group repurchased a total of 389,739 shares of common stock for approximately US$25 million in the first six months of 2018. Heathrow flies to busiest first half ever in 2018, with strong passenger satisfaction scores pushed up demand to fly from the UK’s hub to an all-time high of 38.1 million passengers (+2.5%), with growth across all markets. Four new connections to China in 2018 helped trade through Heathrow grow 2.2% to 841,449 tonnes of cargo. As the summer getaway gets into full-swing, passengers are spending more in Heathrow’s shops pushing retail growth 4.8% higher. Strong retail spend helps support lower airport charges which fell around 1%. Strong retail sales and continued passenger growth pushed revenues up 2.3% to £1,405 million and increased Adjusted EBITDA by 1.6% to £848 million. Heathrow continues to invest responsibly in improving the passenger experience, with operating costs increasing slightly after investments to boost resilience, security and service. International Airlines Group (IAG) has appointed Vincent Hodder as chief executive of LEVEL, its low-cost airline brand. Hodder has over 25 years’ experience working with airlines around the world including low cost carriers such as Jetstar in Australia and Asia and VivaAerobus in Mexico. He is currently working as chief strategy officer at UK regional airline Flybe where he was instrumental in turning around revenue performance and refining the strategic direction of the business. LEVEL took to the skies in June 2017 and operates flights from Barcelona to Boston, Buenos Aires, Los Angeles and San Francisco. Earlier this month, LEVEL launched flights from Paris Orly to Montreal and Guadeloupe with services to New York (Newark) and Martinique launching in September this year. Its current fleet of A330-200s will expand to seven aircraft next year. Airbus has posted half-year (H1) 2018 consolidated financial results and maintained its guidance for the full year. Net commercial aircraft orders increased to 206 (H1 2017: 203 aircraft) with gross orders of 261 aircraft including 50 A350 XWBs and 14 A330s. The order backlog by units totalled 7,168 commercial aircraft as of June 30, 2018. 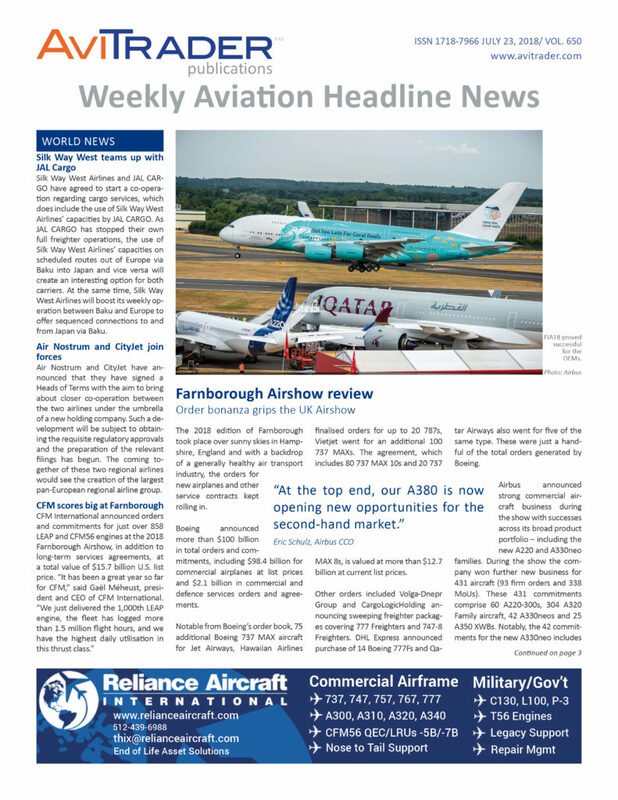 During July’s Farnborough Airshow, Airbus announced orders and commitments for a total of 431 aircraft although these are not yet reflected in the order book. Net helicopter orders totalled 143 units (H1 2017: 151 units). Airbus Defence and Space saw good order momentum, particularly in Space Systems, while there are encouraging prospects for European military cooperation programmes in Military Aircraft and Unmanned Aerial Systems. Consolidated revenues were stable at €25.0 billion (H1 2017: €25.2 billion), reflecting the commercial aircraft delivery mix and perimeter changes as well as the weakening of the US dollar. Deliveries totalled 303 commercial aircraft (H1 2017: 306 aircraft), comprising 239 A320 Family, 18 A330s, 40 A350 XWBs and six A380s. Airbus Helicopters delivered 141 units (H1 2017: 190 units) with revenues mainly reflecting the perimeter change from the sale of Vector Aerospace in late 2017. Revenues at Airbus Defence and Space reflected the stable core business and solid programme execution as well as the perimeter change mainly related to the divestment of Defence Electronics in February 2017 and Airbus DS Communications, Inc. in March 2018. €1,162 million (H1 2017: €553 million). Airbus’ EBIT Adjusted of €867 million (H1 2017: €257 million), reflected mainly the strong improvement on the A350 programme and the A320neo ramp-up and transition. A total of 110 A320neo aircraft were delivered (H1 2017: 59 aircraft) with more NEO (new engine option) versions delivered than CEO (current engine option) versions in the second quarter. The ramp-up is ongoing. Engine manufacturers are working to meet their commitments and resources and capabilities have been mobilised internally. A recovery plan is in place and the number of stored aircraft has started to decline from the end of May peak but risks remain to meet the 800 aircraft delivery target, which is challenging. On the A350 programme, the first A350-1000s were delivered to Qatar Airways and Cathay Pacific in the half-year. Good progress was made on the recurring cost curve compared to a year earlier as the programme ramps up to the targeted monthly production rate of 10 aircraft by year-end. The A350’s industrial system is now reaching a mature level with the focus remaining on recurring cost convergence. Route proving flights have now been completed on the A330neo with more than 1,000 flight hours accumulated by the test aircraft fleet. The first delivery is expected end summer. In July, the BelugaXL transport aircraft completed its maiden flight. Airbus Helicopters’ EBIT Adjusted increased to €135 million (H1 2017: €80 million), reflecting solid underlying programme execution which compensated the lower deliveries. Consolidated net income of €496 million (H1 2017: €1,091 million) and earnings per share of €0.64 (H1 2017: €1.41) included a negative impact from the foreign exchange revaluation of financial instruments partly offset by the positive revaluation of certain equity instruments. The finance result was €-303 million (H1 2017: €+72 million). Net income also reflects a higher effective tax rate from the reassessment of tax assets and liabilities. Leonardo, the Italian global high-tech company, has launched the LEAP2020 (Leonardo Empowering Advanced Partnership 2020) program as a new model for the company’s supply chain in the aerospace defense, and security sector, with visible results anticipated within the short as well as long term. Alessandro Profumo, CEO of Leonardo, commented that: “The LEAP2020 program, one of the initiatives in our 2018-2022 Industrial Plan, is an innovative approach to supplier management,” adding: “It will create a virtuous circle that will strengthen the Company and, more broadly, the industry as part of country system as well as presenting more consolidation opportunities in the sector. The project is based on an open platform that, starting with one-to-one relationships with each supplier, will lead to real, mutually beneficial partnerships”. In its initial phase, LEAP2020 will focus on suppliers considered to be of strategic importance to Leonardo, those that the Company spends around €1 billion (US$1.17 billion) with and which supply to multiple Leonardo divisions. The program defines a model for the selection of a new “growth partner” based on an independent assessment of a supplier in terms of capability, competitiveness, transparency, traceability and sustainability. Leonardo believes the LEAP2020 program will generate benefits in the short term, with larger gains, in some cases in the region of 20% improvements in deliveries and quality, expected in 2020. WOW air, Iceleand‘s only low-fare airline, will now take Canadians from airport runways to high fashion Italian runways all year round as the airline expands its service to Milan starting this November. Travellers from Toronto and Montreal will be able to plan an affordable Italian escape this winter, leaving foodies with enough budget for what really matters – pizza, pasta and a Milanese staple, aperitivi. And, with improved connection times expected to cut travel time by 12 hours, culture vultures will have plenty of time to explore the Santa Maria delle Grazie, which houses Leonardo da Vinci‘s The Last Supper or stroll along the Naviglio Grande, one of Milan‘s two canals. Rounding off a highly successful Farnborough Airshow last week, Pattonair, the expanding global supply chain provider for the aerospace and defence industry, renewed its parts support contract with Bristol, UK-based McBraida for a further three years. McBraida Group is a high precision, high quality machined parts supplier to the UK and international aerospace industries. It manufactures high precision engine and other aerospace components. Both companies have been working together for more than 15 years, and this latest long- term agreement fully solidifies their long-term relationship, with a view to further grow the businesses together. McBraida fully supports and is on track to achieving the Pattonair Gold Standard, a programme created by Pattonair to enhance their supply base.